The original and untraditional prevail over the trivial and commonplace in the life and creative work of the sculptor Raphael Arutyunyan. The representative of Armenians, the “Biblical People”, born in Baku, the capital of another sunny Republic of Azerbaijan, he developed into an original artist in the North – in Estonia, where in 1966 he graduated from the Tallinn Institute of Fine Arts (Sculpture Studio). The author of outstanding works which were favorably received by his colleagues and the public as well as by foreign art-lovers and collectors, he has hardly sold a single work to private collections, despite frequent and tempting offers, and that was done intentionally,. All his life almost from his schooldays, Arutyunyan has been fighting for the right to be himself, to be the personality in art, for the “art for soul” and not the “art for sale”. His graduation work – a four-figure monument to the victims of the Jewish ghetto in Odessa, – caused grave disputes among the members of the Examining board, who were still under the influence of the scandal following the appearance of the poem “Babyi Jar”(Women’s Ravine) by Eugeny Yevtushenko. Many of the sculptor’s ideas were not realized, for example the project of the monument “The Shadows of the Fallen Appeal” (1976), or “Repeated in Chile”(1977). In fact during the period of stagnation there was no place for them in the State Plan of Monumental Propaganda because they were in contrast with the standards of the official social realism doctrine in monumental art. Such memorials as “This Crazy, Crazy World. Afghan Syndrome”(1989), “Salikhard-Igarka Dead Way”(1990), “Dedicated to the Victims of Stalinizm” (1992) and others seem not to pretend to proper scale, material and a specific space. In its idealistic and romantic nature these memorials are akin to the great Utopia monuments of the 20th century, such as ” Tower-Monument to the III International” by Vladimir Tatlin and “Life Tree” by Ernest Neizvestny. Arutyunyan’s complex and polychrome the world of art, where everything is mobile and changeable, is full of intrinsic energy. This world is capable of metamorphoses through paradoxical associations, avoiding stagnant and monosemantic formations, strict limits of genre and aspects. A significant epoch-making and at the same time tragic theme may find realization in comparatively small works “Hard Times.1937″(1986), “Sun Over the Ghetto”(1969), “Tree of Grief”(1975), “A Figure in the Space”(1976), “Warning. Chernobl”(1990) and also in the decorative work “Black Madonna”(1980). Arutyunyan’s colorful palette can transform even conventional combinations of various colors of the major or minor gamut. So, for example, the black color can determine optimistic vitality in the composition “Hula Hoop”(1969), but on the contrary colorfully decorative “The Head of a Baltic Man”(1990) can make a spectator feel depressed and create the atmosphere of uneasiness and anxiety. We’ll choose as an original symbol of his innovator’s restless spirit the three-figure composition “Spiritual Mood”. To look at it might be a purely decorative, exquisite sculptural triptych , but unexpectedly this work combines violent fantasy of plastic thinking and masterly handling of separate parts, grotesque buffoonery and serious thematic satiation, impetous dancing game of forms and strict consistency of the main rhythmic melodies. 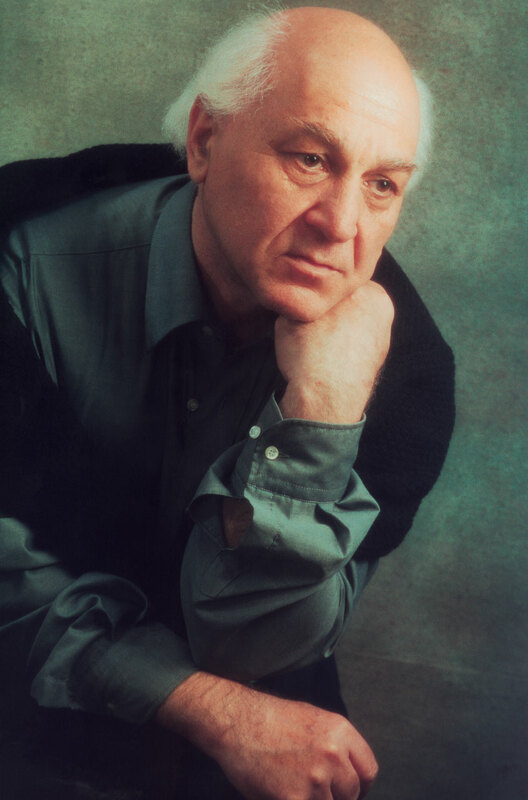 Other Arutyunyan’s works may serve as a symbol of his complex emotional and intellectual character of his creative work. Many of them are to a certain extent autobiographic. “I am in them, they are in me”, – this confession of the author may be referred to the sculpture in bronze “Danko” (1983), and to the portrait sculpture “Minas Avetisyan”, the composition “Armenoid” and the painted portrait of Komitas. And in such a way till the “Decorative Boulder” (1987), and “An Old Gnu” (1976), also somewhat autobiographic, in spite of it’s untypical for the portrait animalistic genre. That is why it is so boring for the artist to create works intended simply to decorate but not to disturb the set mode of life of Philistines, giving them the feeling of comfort, well-being. Although that has never been difficult for Arutyunyan to achieve aesthetic perfection in the works of art, meeting hedonistic demands of the highly professional taste, gladdening the eye by the original interplay of forms, by virtuoso material handling and other visual pretentious novelties and effects. The Master, as a man who has been until recently in irreconcilable opposition to the official culture, can not so easily find orientation today under the commercial market conditions which replaced the ideological pressure. Arutyunyan is invariably attracted by the images, addressed “to the town and the world”, the images, in a good sense, publicistic, appealing to the feelings of compassion of the widest audience.